SOS Program - Jewish War Veterans of the U.S.A.
For as long as soldiers have been serving away from their homes and loved ones, a package from home has always been an important reminder from those for whom the soldier is serving that shows their love and caring for the well-being of the troops. Those who are fighting in distant lands especially need the support and care of those who remain on the home front. 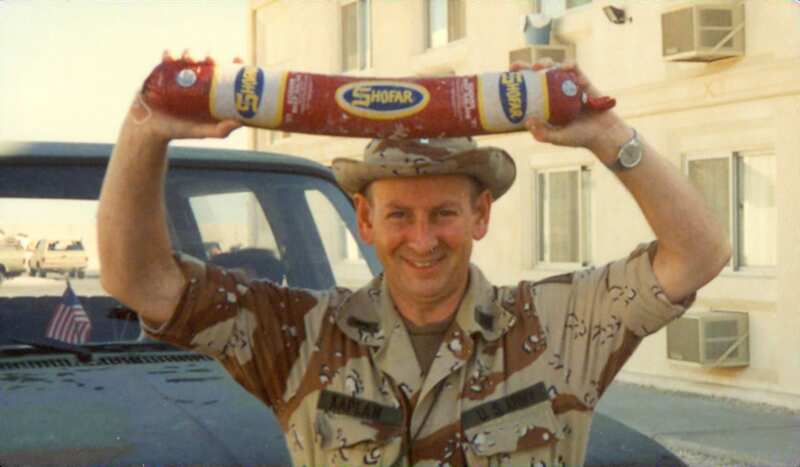 The ringing phrase from World War II, “Send a Salami to a Boy in the Army,” is just one example of how a taste of home has been important throughout history to those who leave their homes in order to defend them. The JWV SOS (Support Our Servicemembers) program is the latest recognition of this desire to let those who are currently serving know that we on the home front are thinking of them and supporting them. Through this program the JWV sends packages, generally of toiletries and kosher food items to those who are serving in Iraq, Afghanistan, and other places of conflict throughout the globe. We also supply special foods and ritual items for those celebrating the Jewish holidays on the battlefield. The JWV can also customize packages to specific requests, such as those we have filled for coffee, packaged kosher meals, or items customized for special needs, such as an Oneg Shabbat. Since 9/11, new rules have been put into effect to protect the security of our troops. Because of this heightened security, packages can be sent only to a specifically named service person with a specific APO or FPO address. No package will be delivered to “Any Soldier,” for example. JWV will send the packages to specific servicemembers, ensuring that your package will get delivered. Therefore, the JWV actively requests that members who know of soldiers who are currently serving send their names and APO addresses with or without specific package requests to JWV National Headquarters, 1811 R St., NW, Washington, DC 20009. We will send packages to all whose names we receive, regardless of religion. All are fighting to protect and serve us. If you would like to help support this program, you can donate online, over the phone or by mail. To ensure that your support goes to this program, note that the donation is for the “SOS Program”. We rely on the generous donations from our members and other supporters to sustain the acts of loving-kindness and tzedakah that are the basis of our SOS program. Please note that anything which can melt or spill should be placed in a sealed zip-lock bag. Most soldiers are given MREs (Meals Ready to Eat) when deployed or training in the field. If you have ever seen or eaten an MRE, you know that they are not especially “delicious” flavors – which is why snacks and other ready to go foods are appreciated by the troops. There is a lot of down time while in training or on deployment. Things like decks of cards or books can really help our servicemembers stay motivated to complete their missions. Some soldiers can be stationed in geographically isolated areas where kosher foods and items are difficult to come by. It is important to send troops these items so that we can keep their Jewish traditions and faith strong.